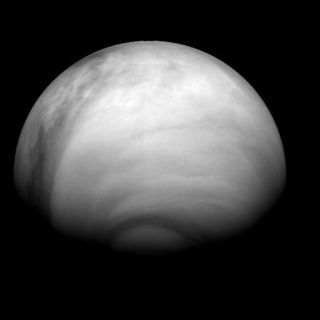 Venus’s atmosphere, taken by the Venus Monitoring Camera (VMC) during Venus Express orbit number 459 on 24 July 2007. The view shows the southern hemisphere of the planet. Mars and Venus, those seemingly contrasting planets ofself-help book fame, have more in common than you might think. Two nearlyidentical spacecraft around Mars and Venus have compared the two worlds'atmospheres and found them to be surprisingly similar. The ESA's MarsExpress and VenusExpress are currently in orbit around the planets taking measurements oftheir atmospheres as they interact with solar radiation. The data show thatcharged particles from the gas layers around both planets are being scavengedby solar wind and storms. "Mars and Venus are very different planets," saidDavid Brain, a planetary scientist at the University of California, Berkeley,and a supporting investigator for Venus Express. "Venus's atmosphere isvery thick, dry and hot, and Mars's atmosphere is very thin and cold. And yetthe same processes are happening on both planets." Both Venus's and Mars's atmospheres are about 95 percentcarbon dioxide. Earth's is mostly nitrogen now, but scientists think it used tobe more like the other rocky worlds. Because neither of our neighboring planets has a global,protecive magnetic field, the solar wind is free to interact directly with theplanets' atmospheres. Solar radiation energizes atmospheric particles so thatthey accelerate and escape from the planets. Earth is spared from the brunt ofsolar radiation by its protectivemagnetosphere. "These results really highlight what a special placeEarth is and how lucky we are to have an atmosphere protected by a magneticfield," Brain said. By analyzing the spacecrafts' treasure trove of data,researchers hope to learn how these two planets' climates have changed overtime and to compare their evolution to Earth's atmosphere. "We want to understand why Earth is different from Mars,why is it different from Venus, why are the inner planets different from theouter planets," Brain told SPACE.com. "As a scientist it'samazing to have the same set of measurements at both planets simultaneously. Agreat example is the solarstorm. We got to see the same event measured at two different places." In December 2006, a powerful solar storm erupted, sprayingjets of charged particles outward. Venus and Mars were smacked with radiation,causing particles in their atmospheres to gain energy and escape ? Mars lostatmospheric particles 10 times faster than it usually does. "I like to think of the solar storms as tsunamis in theatmospheres of the planets," Brain said. "It was very intense andsaturated many of our instruments. It was a lucky encounter, maybe not for theatmospheres, but for us who were watching."